Doug Millard was aged 12 when he made this model of the Apollo 11 space module. He’s now curator at the Science Museum. An almost 50-year-old Apollo 11 model made by a 12-year-old boy is going viral for a heartwarming reason: the model’s maker is now a curator at London’s famous Science Museum. 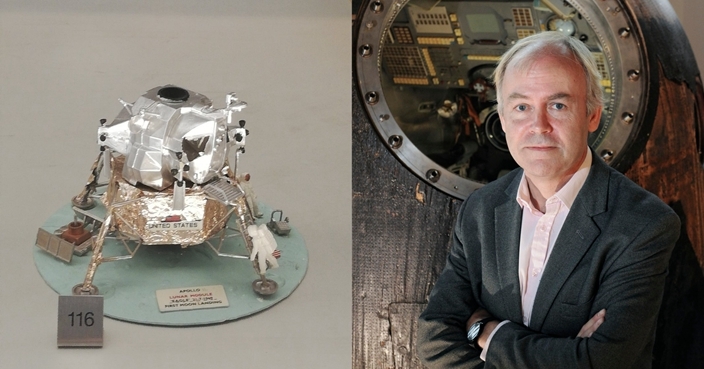 Doug Millard, now deputy keeper of technologies and engineering at the museum, made the model of the moon landing module on his kitchen table as a child in 1970, using a kit covered in foil chocolate wrappers. His passion for science saw him get a job at the museum in 1985 and he has worked there ever since. The model has been on display in a gallery of the Science Museum since 2000, however, its story received thousands of comments and retweets after a museum employee posted about it on Twitter. Mr Millard received the Apollo 11 model-making kit along with a Saturn V Rocket kit for Christmas a young boy, both of which are displayed at the museum after a colleague asked to put them up. Mr Millard said: “I was just one of many young people who were transfixed and glued to the television … really from 1968 and the Apollo 8 Mission, through to 1972 and the final mission. It was compulsive viewing. Social media users loved the story of Mr Millard, with the post reaching over 7,000 likes and one user commenting that the museum curator was “now living the dream”. Mr Millard said: “There are so many items in the museum, and different people look at them in different ways, obviously with social media there’s a whole new way of communicating about them and sharing them. Mr Millard said that the museum is currently planning how it will mark the 50th anniversary of the Moon landing in July this year.